Not satisfied with ‘Steelheart’ – yes, it was a young adult novel, which I had completely overlooked to see what type of genre it was in – I went browsing again, and another Brandon Sanderson book popped up – ‘Words of Radiance’. It was the second book in a series. hmmmm …. reading the reviews, it sounded like it could be one of those epic series that I wanted to immerse myself in. But Brandon Sanderson again, after the less than satisfactory experience the first time? I decided to take the plunge, and used up one of the precious Audible credits to purchase the book. If I didn’t like the first book – ‘The Way of Kings‘ – then I didn’t have to buy the second book, which had just been released. As you see, I’m already on Chapter 13, two days later. It’s got 106 chapters … 106 !! If this was a printed book, that would be over a thousand pages, right? 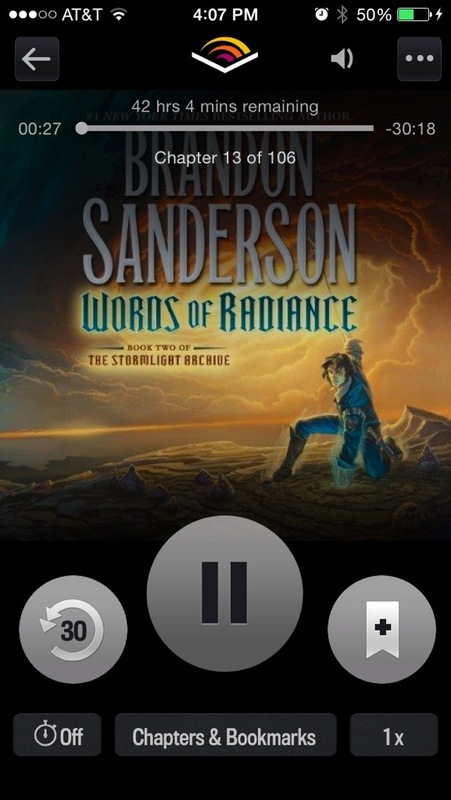 (That’s another on my to-do list … read a book that is at least 1,000 pages long … do audio books count?) It’s kind of slow-going again, these early chapters, but I’m sure it’ll speed up soon. The quote above is from the first book, ‘The Way of Kings’. It struck me that this is probably why we have the alphas among us … for them, everything is an entitlement, being the first-born, the leader, the chosen one … If they do not get what they want by entitlement, then they use force of will, using the entitlement, to get what they want. Hmm may have to try it…. hmmmm … try the book? or try the force of will/entitlement thing?